The General HD Sound Effects Collection is Sound Ideas signature sound effects library. It was 3 very busy years in the making. The General HD Combo Sound Effects Collection is a high definition general sound effects library that includes the content of both The General HD and the The General HD 2 for a massive 32,839 royalty free sound effects. Studio Box, now in version Mark III, is one of the most extensive and versatile sound effect libraries at all, worldwide. A great sound archive for film, advertising, music and games production. Blue Box - state of the art sound effects 16 CD Set mixed mode WAV / audio. Incredible variety of sounds Blue Box contains one of the world `s most impressive sound libraries.Diversity and authentic sound FX distinguish this box from all others. Made for film and multimedia production this library is a treasure trove for Ambient Music and commercials. 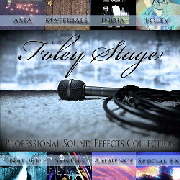 Foley Stage is the first Sound Library to be recorded on the Asian continent. Ambience recordings from Asian cities and villages, Ambiences from real life situations, Asian ceremonies, weapon- und battle sounds, firework sounds, electronically sounds from synthesizers, sci-fi and monster sounds and the absolutely essential and globally usable basics from a sound archive.